Pinot Noir was successfully introduced into Alto Adige on the beginning of the 19 century. It soon became evident that the gently sloping terrain and the micro-climate at Mazon were perfect for producing Pinot Noir of international stature. Soil: A mixture of clay, lime and eroded porphyry. Winemaking: 75 percent of the bunches are de-stemmed, while the remaining 25 percent are placed whole in the fermentation vats. Fermentation lasts 10 days, during which the skins and other solids are constantly kept loose and submerged in the must. Deion: The Meczan Pinot Noir is distinguished by its unmistakable varietal character, its distinctive aroma and fruity character, by its bright ruby colour with garnet reflexes, and its fresh, stimulating bouquet with seductive hints of woodland berries and cherry. 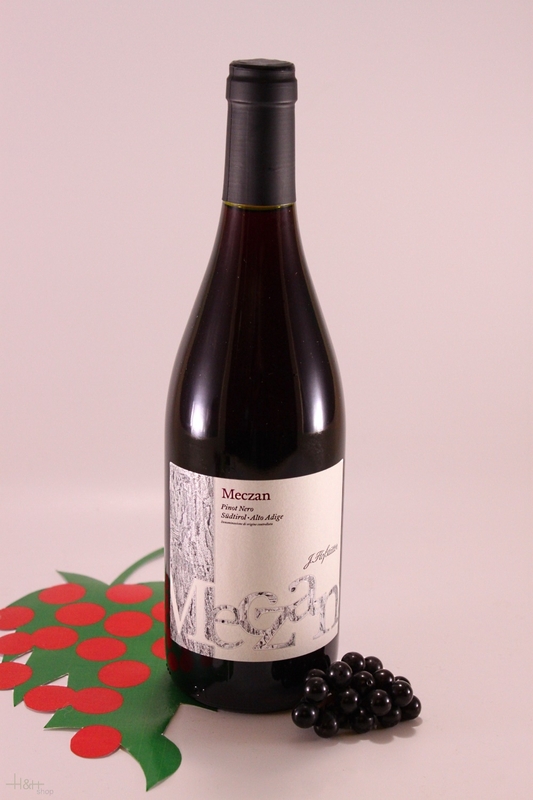 On the palate Meczan is harmonious, sappy and mellow with impressive fruit. Food Choices: Game dishes, roasts, pasta with meat sauces and with one of Tyrol's great "poor-man's dishes" - barley soup. "Wine & Spirits Magazine" has rated the wine "J. Hofstatter Joseph Meczan Pinot Nero - Blauburgunder Alto Adige, Trentino-Alto Adige, Italy" the vintage 2014 on 01.10.2016 with 88 of 100 points. "Wine & Spirits Magazine" has rated the wine "J. Hofstatter Joseph Meczan Pinot Nero - Blauburgunder Alto Adige, Trentino-Alto Adige, Italy" the vintage 2012 on 01.08.2014 with 87 of 100 points. "Wine & Spirits Magazine" has rated the wine "J. Hofstatter Joseph Meczan Pinot Nero - Blauburgunder Alto Adige, Trentino-Alto Adige, Italy" the vintage 2011 on 01.08.2013 with 87 of 100 points. "Vinous Antonio Galloni" has rated the wine "J. Hofstatter Joseph Meczan Pinot Nero - Blauburgunder Alto Adige, Trentino-Alto Adige, Italy" the vintage 2011 on 01.05.2013 with 89 of 100 points. "Wine & Spirits Magazine" has rated the wine "J. Hofstatter Joseph Meczan Pinot Nero - Blauburgunder Alto Adige, Trentino-Alto Adige, Italy" the vintage 2010 on 01.08.2012 with 86 of 100 points. "Wine Spectator" has rated the wine "J. Hofstatter Joseph Meczan Pinot Nero - Blauburgunder Alto Adige, Trentino-Alto Adige, Italy" the vintage 2010 on 31.10.2011 with 90 of 100 points. "Vinous Antonio Galloni" has rated the wine "J. Hofstatter Joseph Meczan Pinot Nero - Blauburgunder Alto Adige, Trentino-Alto Adige, Italy" the vintage 2010 on 01.02.2011 with 88 of 100 points. "Vinous Antonio Galloni" has rated the wine "J. Hofstatter Joseph Meczan Pinot Nero - Blauburgunder Alto Adige, Trentino-Alto Adige, Italy" the vintage 2009 on 01.08.2010 with 88 of 100 points. "Wine Spectator" has rated the wine "J. Hofstatter Joseph Meczan Pinot Nero - Blauburgunder Alto Adige, Trentino-Alto Adige, Italy" the vintage 2005 on 30.06.2007 with 87 of 100 points. "CellarTracker" has rated the wine "J. Hofstatter Joseph Meczan Pinot Nero - Blauburgunder Alto Adige, Trentino-Alto Adige, Italy" the vintage 2013 with 89 of 100 points. "CellarTracker" has rated the wine "J. Hofstatter Joseph Meczan Pinot Nero - Blauburgunder Alto Adige, Trentino-Alto Adige, Italy" the vintage 2007 with 88 of 100 points. "CellarTracker" has rated the wine "J. Hofstatter Joseph Meczan Pinot Nero - Blauburgunder Alto Adige, Trentino-Alto Adige, Italy" the vintage 2005 with 88 of 100 points. "CellarTracker" has rated the wine "J. Hofstatter Joseph Meczan Pinot Nero - Blauburgunder Alto Adige, Trentino-Alto Adige, Italy" the vintage 2010 with 87 of 100 points. "CellarTracker" has rated the wine "J. Hofstatter Joseph Meczan Pinot Nero - Blauburgunder Alto Adige, Trentino-Alto Adige, Italy" the vintage 2012 with 87 of 100 points. "CellarTracker" has rated the wine "J. Hofstatter Joseph Meczan Pinot Nero - Blauburgunder Alto Adige, Trentino-Alto Adige, Italy" the vintage 2008 with 86 of 100 points. "CellarTracker" has rated the wine "J. Hofstatter Joseph Meczan Pinot Nero - Blauburgunder Alto Adige, Trentino-Alto Adige, Italy" the vintage 2009 with 86 of 100 points. "CellarTracker" has rated the wine "J. Hofstatter Joseph Meczan Pinot Nero - Blauburgunder Alto Adige, Trentino-Alto Adige, Italy" the vintage 2006 with 86 of 100 points. "CellarTracker" has rated the wine "J. Hofstatter Joseph Meczan Pinot Nero - Blauburgunder Alto Adige, Trentino-Alto Adige, Italy" the vintage 2004 with 82 of 100 points.